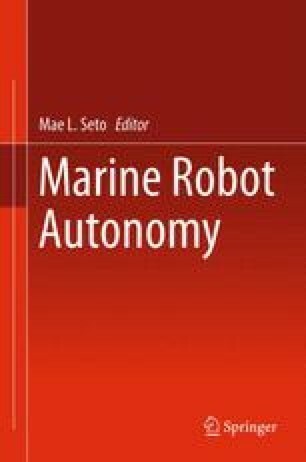 This chapter describes the MOOS-IvP autonomy software for unmanned marine vehicles and its use in large-scale ocean sensing systems. MOOS-IvP is comprised of two open-source software projects. MOOS provides a core autonomy middleware capability and the MOOS project additionally provides a set of ubiquitous infrastructure utilities. The IvP Helm is the primary component of an additional set of capabilities implemented to form a full marine autonomy suite known as MOOS-IvP. This software and architecture are platform and mission agnostic and allow for a scalable nesting of unmanned vehicle nodes to form large-scale, long-endurance ocean sensing systems comprised of heterogeneous platform types with varying degrees of communications connectivity, bandwidth, and latency. The prototype of MOOS was developed by Paul Newman at MIT under the GOATS’2000 NURC Joint Research Program, with ONR support from Grant N-00014-97-1-0202 (Program Managers Tom Curtin, Code 322OM, Jeff Simmen, Code 321OA, Tom Swean, Code 321OE, and Randy Jacobson, Code 321TS). The development of the Nested Autonomy concept for environmental acoustic sensing and the MIT component of the GLINT’08 experiment was funded by the Office of Naval Research under the GOATS program, Grant N-00014-08-1-0013 (Program Manager Ellen Livingston, ONR Code 321OA). The development of the unified communication, command, and control infrastructure and the execution of the SWAMSI09 experiment was supported by ONR, Grant N-00014-08-1-0011 (Program Manager Bob Headrick, Code 321OA). The IvP Helm autonomy software and the basic research involved in the interval programming model for multi-objective optimization has been developed under support from ONR Code 311 (Program Managers Don Wagner and Behzad Kamgar-Parsi). Prior prototype development of IvP concepts benefited from the support of the In-house Laboratory Independent Research (ILIR) program at the Naval Undersea Warfare Center in Newport, RI. The NATO Undersea Research Centre (NURC) has supported the development of the MOOS-IvP Nested Autonomy concept by conducting 7 major field experiments, in which MIT LAMSS has been a partner, including GOATS’2000 and GOATS’2002, FAF’2003, FAF’2005, CCLNet’08, GLINT’08, and GLINT’09. Without the world-class seagoing experiment capabilities of NURC, with its state-of-the-art RVs, NRV Alliance and CRV Leonardo and their outstanding crew, and NURC’s excellent engineering and logistics support, the Nested Autonomy concept and the underlying MOOS-IvP software base would not have reached the level of sophistication and robustness that it has achieved.